Over the weekend of February 14-17, 23 collegiate and independent high school Dance Marathon programs hosted their annual events, resulting in a total of $1,985,734.80 raised #ForTheKids at local Children’s Miracle Network Hospitals! Ball State University Dance Marathon held their 12th annual Dance Marathon. Their fundraising helps to fund the Pallative Care Team and the Magic Castle Cart at Riley Hospital for Children in Indianapolis, Indiana. RebelTHON at the University of Mississippi benefits Blair E. Batson Children’s Hospital in Jackson, Mississippi. Vanderbilt University Dance Marathon benefits Monroe Carell Jr. Children’s Hospital in Nashville, Tennessee. University of Nebraska Dance Marathon benefits Children’s Hospital & Medical Center in Omaha, Nebraska. Cowboython was pure magic!! Thank you x a million for all the people who have dedicated their time & money for a greater purpose – FTK! CowboyThon at Oklahoma State University benefits the Children’s Hospital Foundation in Oklahoma City, Oklahoma. SpartanTHON at Case Western Reserve University benefits University Hospitals Rainbow Babies & Children’s Hospital in Cleveland, Ohio. UD Miracle at the University of Dayton benefits Dayton Children’s Hospital in Dayton, Ohio. After Dance Marathon at the University of Washington had to cancel their Dance Marathon event from the previous weekend due to weather, their friends at Seattle University Dance Marathon invited their program to join in at their event on the Seattle U campus. DM at UW raised a total of $11,654.75 and Seattle U Dance Marathon raised a total of $59.080.44, for a combined total of over $70,000 benefiting Seattle Children’s Hospital in Seattle, Washington. Loyola University Dance Marathon benefits the Ann & Robert H. Lurie Children’s Hospital of Chicago. Youngstown State University Guinathon benefits Akron Children’s Hospital in Akron, Ohio. Spartython at Michigan State University benefits Sparrow Children’s Center in Lansing, Michigan. Boston College Dance Marathon benefits Boston Children’s Hospital in Boston, Massachusetts. EagleTHON at American University benefits Children’s National Health System in Washington, DC. 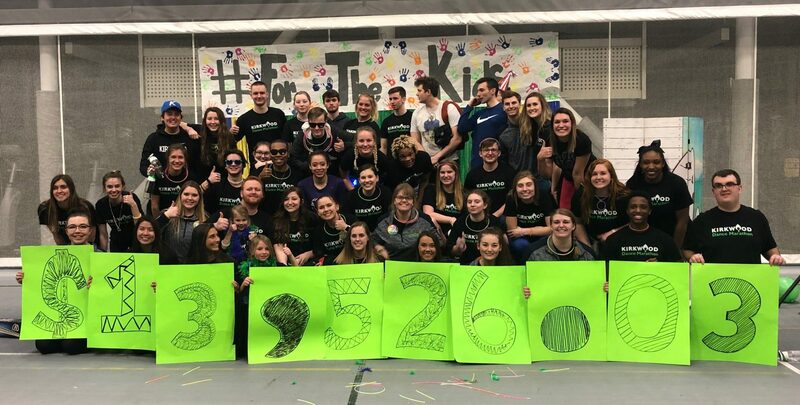 University of New Hampshire Dance Marathon raised $32,523.50 at their annual event, benefitting Boston Children’s Hospital in Boston, Massachusetts. Kirkwood Dance Marathon at Kirkwood Community College benefits the University of Iowa Stead Family Children’s Hospital in Iowa City, Iowa. We Are For The Kids!! $12,815 raised and 12,815 miracles made by our wonderful committee, dancers, sponsors, and supporters! We loved having you all celebrate with us!! RazorThon at Nova Southeastern University benefits Nicklaus Children’s Hospital in Miami, Florida. Dance Marathon at the University of Wisconsin, Platteville benefits the Children’s Hospital of Wisconsin in Milwaukee, Wisconsin. Thank you for everyone who came out to support us! Our goal was originally 5000 and we exceeded our goal far past what we ever thought! Ending with $8,120 was truly remarkable! Great executive board that put this together and without them it wouldn’t have been such a success! Can’t wait for next year and the amazing growth of North Browards Dance Marathon! North Broward Prep School Dance Marathon benefits Nicklaus Children’s Hospital in Miami, Florida. $6,481 ALL FOR THE KIDS!!!!! Bloomsburg University Dance Marathon benefits Geisinger Janet Weis Children’s Hospital in Danville, Pennsylvania. CougarThon at Collin College benefits Children’s Health Children’s Medical Center in Dallas, Texas. VandalTHON at the University of Idaho raised $2,973.77 at their 2019 event, which benefits Sacred Heart Children’s Hospital in Boise, Idaho. UAB Dance Marathon raised $1,836 benefitting Children’s of Alabama in Birmingham, Alabama.